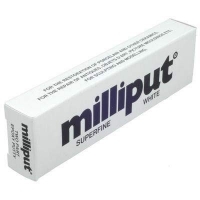 Milliput Superfine White Epoxy Putty 113gWhite Milliput is a two part super fine white putty weighing 113g.For the restoration of porcelain and other ceramics for the repair of antiques, objects d’art, Victorian dolls, picture moldings, etc. For sculpting and modelling. For the repair of white domestic chinaware and for filling scores and dents in white domestic equipment e.g. washing machines, refrigerators, etc. Also for cracks and chips in tiles, sinks and baths.Milliput features:Self hardening Non – shrinking Tough and durable Highly adhesive to most materials Water and chemical resistant Sets under water and is electrically resistant molds like putty – sets rock hard It is very important when using this grade of Milliput, because the sticks are virtually the same color, that you mix the two parts for at least five minutes.Mix together equal parts of each stick from the pack. Knead and roll in the hands for at least 5 minutes until the colors merge and become uniform and no streaks can be seen, and then mix for another minute. The surfaces to which the putty is applied should be free from grease and dirt. Smooth surfaces should be cleaned with a suitable solvent or with soap and warm water to remove dirt and grease. Abrading the surface will improve adhesion. The putty may now be applied and will set hard in three to four hours without shrinking. After setting hard Milliput continues to cure and is fully cured after over five hours at the same temperature. Once fully cured Milliput can be machined, drilled, tapped, turned, filed, sawn, sandpapered and painted. Milliput can be sandpapered and painted immediately it has set. .